The best bet is to avoid the weather risks entirely. Here, as we’ve been saying, speed is of paramount importance. Equally important is good steering control, at high speeds when running with a storm, and at slow speeds when maneuvering around breaking seas while your jogging into them. 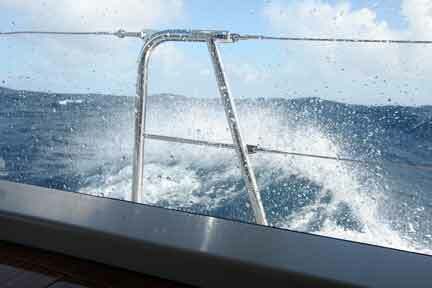 We know that our the FPB 83 has a wonderfully soft motion at sea. She is more comfortable than any of our sailboats at all angles of wind and wave. This is true off the wind where we are a little more comfortable than we’ve been used to. And upwind the differences are simply amazing, as we can power along at 11 knots into tradewind seas with hardly a thump (compared to what we are used to under sail). But we also need to think about what happens if we make a mistake with our weather routing, or the boat is somehow disabled, as unlikely as this may be with the over engineered drive lines we are using. If we’re caught in dangerous conditions, how the boat behaves in breaking seas means the difference between an experience we’d rather not repeat and something far more serious. With the FPB Series the characteristics which make them safer in heavy weather also make them more comfortable in normal ocean crossing wave systems. In order to explain how these factors work – on all types of vessels – we need to take you through a little theory on stability and motion. We’ll start with some generalizations, and then get on to how this works to make the FPB Series so comfortable and safe.. Stability and comfort characteristics with sailboats are relatively easy. The more stable the boat, the faster and (usually) more comfortable it is. Since a key component of this stability is the vertical center of gravity (VCG -the center of all of the weight which makes up the boat), designers and builders work hard at keeping structure above the waterline as light as practical. The other component of stability is the hull shape when upright and at various angles of heel. More beam equals more stability, but also creates drag. So there is a lot of refinement that goes into how the hull interfaces with the water. 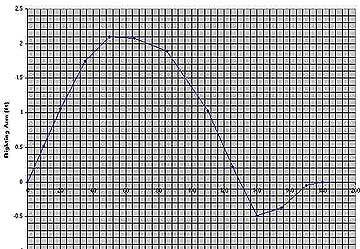 This stability curve for the FPB 83 is optimal in terms of recovery from a capsize. You can see that the boat does not lose its upright stability until it is heeled past 130 degrees – with the deck 40 degrees past vertical. Then look at the amount of stability when the boat is inverted and compare it to that with the boat right side up. This ratio, very little inverted stability means the boat will come back quickly. Another important point is the fact that maximum stability does not begin to taper off until after 100 degrees of heel has been reached. You would think that a powerboat would be a lot simpler. Since there is no sail to carry, stability is not an issue. But life on the water is never this easy. There are several other aspects of power boat stability which have to be addressed: First is the initial stability and second is roll period. These are comfort issues. The third is the capsize resistance of the vessel. This is a function of both polar moments and the limit of positive stability (LPS – the heel angle at which the boat will capsize, from which it may, or may not recover). If a knockdown by a breaking sea cannot be avoided, then we move on to how the wave energy is absorbed, and if a complete capsize can be averted. There are two components in this. The first is that the boat is not locked into position by the deck edge, hull, or keel/rudder combination. We want to see the boat skidding sideways after the wave impact, allowing it to absorb the wave energy over time. This limits how far you will heel. All our sailboat designs have been engineered in this fashion for the past 30 years. The second issue is LPS – just how far can the boat heel before it will keep going (and how quickly it will come back). One of the facts which startled us when doing research for our book Surviving the Storm, was the calm manner in which the professional seamen on large ships and motor yachts we interviewed discussed what would happen if the right wave caught them at a vulnerable angle. The norm for most motor yachts, ships, and military vessels is a maximum heel angle of 60 to 70 degrees, after which the boat keeps going and does not come back. They accepted that their ships would capsize. One of our former clients, who had circumnavigated on a Sundeer 64, told us of a 50-knot gale he weathered, hove to behind a parachute anchor, in a heavy displacement 55-foot steel trawler. He said he felt they would not have survived much worse conditions. He returned to port and put his new trawler up for sale. We’re too conservative and have too much respect for the sea to tempt the odds in this fashion. Sure, if you have propulsive power you can head into the waves when it gets really gnarly, but what happens if you lose power, or you make a mistake dealing with a crossing sea which is breaking? It is a given for us that any vessel on which we venture offshore is going to have good capsize resistance, and in the event of exceeding the limit of positive stability, be assured of self-righting. Meeting these objectives isn’t hard. What is difficult is doing it on a design which is also comfortable for the crew the 99% of the time we are in nice weather. Now for a little stability theory. There is a term designers use called GM, which is derived from the waterplane shape of the hull, the metacenter – M and the vertical center of gravity. Wider hulls have a higher GM. Lowering the vertical center of gravity increases GM. Both of these create a more stable boat with faster roll period. Once you understand how these elements work together, it is easy to see why trawlers have such a problem with capsize resistance. Trawlers typically have beamy waterlines, with very full ends. This shape creates a lot of initial hull stability that generates a fast roll period, if the vertical center of gravity is low enough to insure an adequate range of positive stability. However, this is so uncomfortable for the crew that to reduce the roll period the vertical center of gravity is raised. This drops GM, slows down the roll period, and makes the boat easier to live with in normal sea states. That is why trawler manufacturers tell their owner’s to add weight up high – like dinghies on the highest deck, to slow down the roll period. What nobody is discussing is that this also makes the boat a lot less safe in heavy weather and in fact leads to a configuration which will not recover from a wave induced capsize. There is a way around this, but it takes a totally different approach to design and construction. There is another aspect to design and comfort. Whether you are anchored in a rolly anchorage, or on passage with beam seas, powerboats require some form of a roll resistance system. 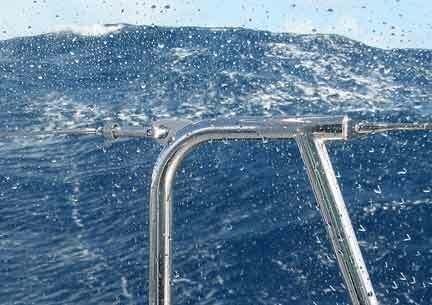 This can take the form of bilge keels, “fish” dragged from the ends of booms, or active fin stabilizers. Regardless of the system employed, the work this gear has to do, and its effectiveness, is a function of boat speed squared and the initial stability of the hull shape. The more initial stability in the hull form, the greater the force a wave can exert on that hull, and the more energy the stabilizing system must generate to offset that force. Put simply, the less initial stability you have, the better the job your stabilizing system can do towards keeping you from rolling when you are at sea. In our case the same characteristics that are desirable for a slippery boat, which does well in headseas and breaking waves, also reduces the energy required to offset rolling. It is a win/win situation. Couple this with oversized active stabilizers (which we’ll discuss later) and you have the best of all possible worlds. If you want to see how this works in a North Atlantic gale, click here. Lets go back to roll period for a minute. The motion your body senses is a function of the quickness of the motion, and how far you (or more precisely the space between your ears) is from the roll center of the boat. The closer you are to the roll center, the less you will feel whatever motion is occurring. This is why you hear stories of crews sleeping on the cabin sole in heavy weather – being lower brings them closer to the roll and pitch center so the relative motion is reduced. In the normal powerboat interior layout, maximizing interior space is the design goal. This works at the dock. But all those layers of interior space put you further and further away from the pitch and roll center both vertically, and along the length of the hull – exacerbating the way the boat’s motion feels to the crew. The motion you would feel while standing watch twenty feet (6m) above the pitch center with a six-second roll period is the same as you feel at ten feet (3m) above the water with a three-second roll. But in terms of capsize resistance, the vessel with the three-second roll period might have a range of stability of 130 degrees while the six-second vessel might only be 70 degrees. Which configuration would you prefer crossing the Gulf Stream in a Norther, or trying to make it into Bay of Islands, New Zealand with a compression zone gale howling about your ears? If you take a close look at the photo above you will notice a 20 foot plus (6m+) wave rearing up. We spent 36 hours in these types of waves leaving New Zealand for Fiji and found the FPB 83 amazingly stable and comfortable, with typical heel angles of plus or minus 5 degrees or less (to watch video of this gale click here). 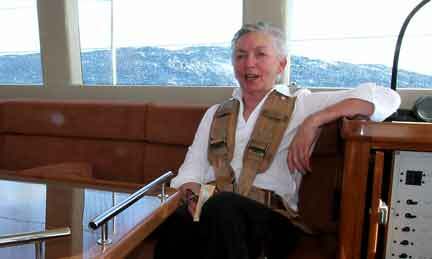 The harness which Linda is wearing serves two purposes. One, in the event of a significant wave impact it holds her in place. Two, to the extent there is any rolling motion the harness holds you in place, substantial reducing fatigue (this is the only time in our first 45,000 miles that we’ve used these harnesses, except when crossing harbor bars with the potential of breaking seas). You are probably asking yourself how does all of this technical stuff manifest itself in the FPB series? Let’s start with the hull. Using a variant of the slippery hull that has been so successful for us over the sailing years – modified just a little for the different weight distribution of the FPB, we have a very efficient platform with minimum horsepower requirement to move it at fast ocean crossing speeds. Next, employing a similar interior layout to that of the sailboats we are used to – large engine room aft, big forepeak forward, and living quarters centralized, we end up with an interior in which nobody ever sleeps or sits more than 10′ (3m) from the motion center of the boat when at sea. If we keep the watch-standing station low – just high enough to have good visibility, the maximum vertical distance from the pitch center is just a hair over six feet (1.8m). In short, the crew is living close to the pitch and roll center, so that the perception of whatever motion the sea was imparting to the boat is minimized. After the first hour of sea trials we knew this was working. Now, after 45,000 miles of cruising with Wind Horse, much of it in conditions we would not have tackled in any of our sailboats, the only problem is that we are too comfortable. It is doubtful whether we’d go back to crossing oceans now under sail. Lets take a quick look at a series of wave photos we shot between New Zealand and Fiji. These were taken on a day with 20 foot (6m) occasionally breaking waves. 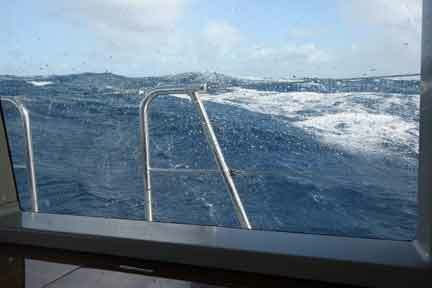 Keep in mind that the camera tends to make waves look a lot smaller than they do onboard. Note the crest off in the background. These usually rear up here and there, but rarely come into contact with the boat. We’ve cropped the photo in tight to give you a better feel for this crest. In this shot it is about 100 feet (30m) to windward. 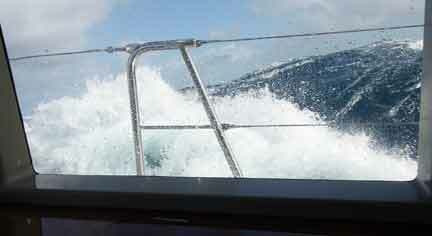 A few seconds later and we meet the crest with our topsides. 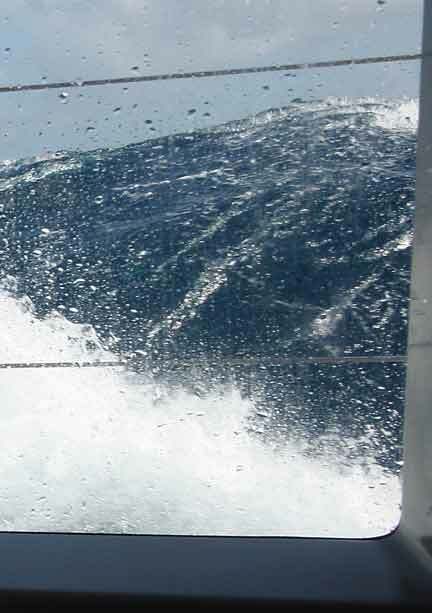 This wave impact, which we hear but do not really feel, is recorded by onboard sensors. Heel angle is four degrees. Check out the next crest, on the right side of the photo. We missed the impact photo, but caught this image just before we were hit. This crest gave us the only good smack of the entire passage to California. We heeled to 17 degrees, and were back to vertical within 2 seconds. 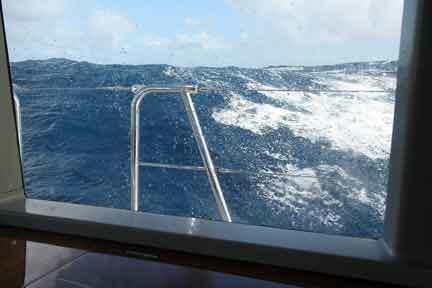 It is amazing to think that the FPB is comfortable even in these conditions. Early on in our normal design process we review how the boat will float at various heel angles, and when it starts to skid to leeward with wind and wave. We design so that when the boat reaches a certain angle of heel, it begins to skid to leeward, dissipating wave energy as it goes. Engine room air intake design is such that even in a full inversion, no more than a small amount of water can enter this space. We don’t dwell on these risks. But we enjoy going to sea a lot more knowing that should we encounter bad weather, we have the best tools with which to deal with the elements. For related info, see Surviving the Storm pages 608-621 (Design Factors), and pages 628-631 (Powerboat Design). Also see Offshore Cruising Encyclopedia pages 407-421 (Cruising Design). This entry was posted on Wednesday, October 19th, 2011 at 3:05 pm and is filed under Dashew Offshore, Design Objectives, Left Sidebar Posts. Both comments and pings are currently closed.